Art as Usual: Wire Embellishments- Coming SOON! I stayed up late the other night writing with wire. It was fun and I liked the look so I just kept going... and going...and going. In fact I bent the night away! I was watching Cold Comfort Farm while doing it and the time just flew. On occasion people have purchased items from me to use in their own artwork. Birds, flowers, words, little bits of this or that. I love the idea that they are combining my work with theirs. So for a while now I've had it in mind to try selling some of my wire work as "supplies" on my Etsy site. I thought I'd start with words. I've used them stitched into mini art quilts, and my canvas paintings, as well as on scrapbook pages. They just seem to add a really nice dimensional layer and I really like the look of the wire combined with fabric and paper. These are sized just right for use in any of those mediums. I also thought that maybe using the words in their mixed media work would maybe encourage more people to pick up the wire for themselves and bend a little of their own. A girl can dream, right? 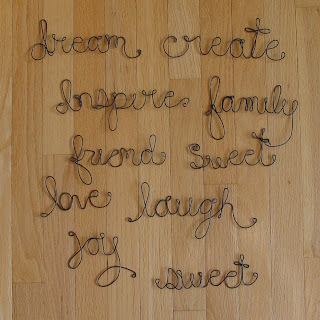 In the meantime.. for all those mixed media artists out there- Wire Words Embellishments- Coming Soon!